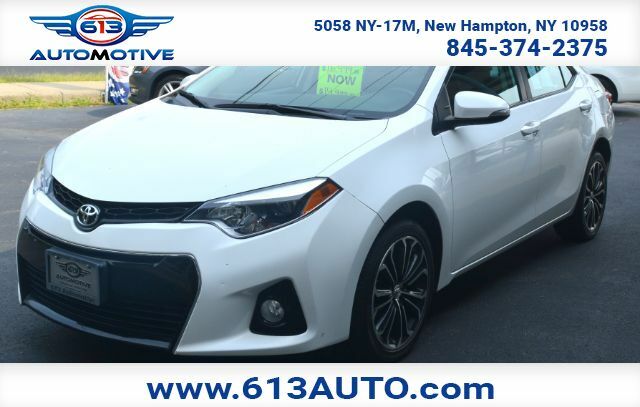 Climb inside our 2015 Toyota Corolla S shown in dynamic Super White. Powering our sedan is a 1.8 Liter 4 Cylinder that offers 132hp on demand, while paired with a seamless shifting CVT. This ideal combination helps you achieve near 38mpg on the open road and is perfect for your commute. It''''s no surprise that our Corolla ranks as the best-selling car of all time! Now with a more modern stance, stunning wheels, and fog-lights, the exterior of the S is a perfect balance of style and efficiency. The attractive metallic-accented interior boasts even more legroom than before with technology that is straightforward and user-friendly. You''''ll appreciate key-less entry, heated mirrors, cruise control, and a 60/40-split-folding rear seat. A 6 inch touchscreen display acts as your personal command center, while Bluetooth, iPod connectivity and steering wheel mounted audio controls are also handy. This quiet cushy ride is sure to please! With a rearview camera, stability control, anti-lock brakes, and airbags, you can rest assured that you and your passengers will be kept safely out of harm''''s way. Driving this car may be the best decision you''''ve made all year! Print this page and call us Now... We Know You Will Enjoy Your Test Drive Towards Ownership!